In an act sure to inflame forum fan boys and delight all who appreciate custom made car/trucks, e46fanatics member bodycustom1 combined a totaled BMW 330 ZHP and the bed from a Chevrolet Colorado to create this, the E46-amino. Car/truck hybrids are a funny thing. Although initially designed for pure utility, style (or lack of depending who you talk to) became a part of car/truck ownership at some point. Love them or hate them, everyone has an opinion on them. I used to own and love a bondo filled 1973 Ford Ranchero so you can imagine my thoughts on this issue. 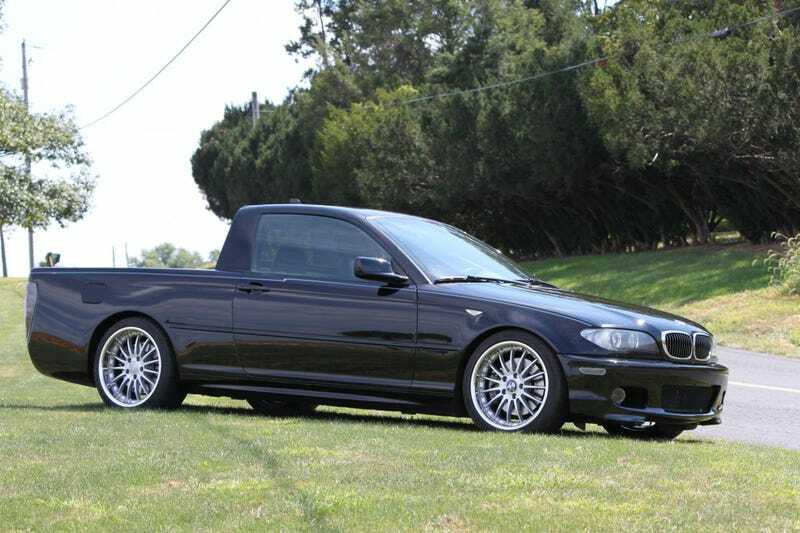 If an El Camino or a Ranchero isn't divisive enough on its own, how about making a car truck hybrid out of a revered sports sedan like an e46 chassis BMW 330 ZHP coupe? As you can see from the pictures this is exactly what one Pennsylvania man did, creating one eyebrow raising and awesome E46-amino. Starting with a with a 330 ZHP coupe that had been rear ended and subsequently totaled, the builder credits his father with the idea of putting the Chevy Colorado bed sitting at the shop on to the back of the totaled BMW. The Colorado Bed although shortened maintained its original width and after cutting the 330's body from the B-pillar back and spending countless hours of fabrication, fit right in. Love it or hate it, the final product came out nicely and is truly an unbelievable piece of workmanship and ingenuity. If the builder hadn't initially bought the totaled BMW it would likely have been parted and crushed. The builder spent under $10,000 from purchase to completion for an end product sure to turn heads and irritate BMW purists wherever it goes.